After a brief contextualization of the dragonkin race in the context of the Xa-osoro system, we are introduced to the dragonkin paragon archetype, which is only available for dragonkin or characters with the partner bond racial trait. The archetype nets an alternate class feature at 2nd level, namely clutch bond, which allows for the formation of partner bonds with two willing nondragonkin creatures simultaneously. All members of the clutch roll initiative and share the highest result, which is a pretty potent option. Additionally, each dragonkin prerequisite feat may be taken as an alternate class feature at 4th, 6th, 12th and 18th level. Speaking of dragonkin feats, there are quite a lot of them inside this pdf, 17 to be precise. Expand Clutch Bond increases the number of partners you can have with clutch bond by 1, and may be taken multiple times. Enhance partner lets you choose EAC, Fortitude saves, KAC, Reflex saves or Will saves or a skill you’re trained in. Whenever you’re within 30 ft. of your partner, you grant them a +1 enhancement bonus to rolls or checks of the chosen kind. (Nitpick: EAC/KAC aren’t exactly rolls or checks, but that doesn’t hamper rules-integrity.) This may be taken multiple times – I assume that you have to choose a new one on subsequent taking of the feat. Dragonkin with Improved Unarmed Strike may choose the Blistering Fangs combat feat, which allows you to replace half of the damage of your unarmed strikes with fire damage, with a swift action usable to turn this ability on or off. The feat properly notes interaction with multi-damage-type unarmed attacks. Kudos! There are three base “Bonded” feats: Bonded Fortitude, Bonded Reflexes, Bonded Will. While the dragonkin and bonded partner are within 100 ft. and conscious (i.e. not asleep, dead, dying, etc. ), both gain a +1 enhancement bonus to the respective saving throw as denoted by the feat-name. Bonded Agility requires Bonded Reflexes: As a move action you can grant your partner the operative’s uncanny agility class feature’s benefits until the start of your next turn. Being out or reach, knocked out, etc. does end the benefits. Bonded Assault requires 3rd level, and when you attack a target you and the partner are threatening, you can spend 1 Resolve Point to roll twice and take the higher result. Dragonkin Senses nets you blindsense (vibration) 30 ft.; Draconian Presence requires 5 ranks Intimidate and nets you frightful presence, activated via 1 Resolve, and with Charisma as governing key ability modifier. Improved Breath Weapon requires 9th level, and increases breath weapon base damage to 2d6, and by a further +1d6 at 12th and 15th level. Mounted Bond applies when you let your partner willingly ride you as a mount, and allows you to make a DC 15 Acrobatics check to shield the partner from harm as a swift action. On a success, the partner gains cover, but can’t attack or cast spells until you or your partner uses a move action to reposition the partner properly. Nice one. Partner Screen applies when your partner is within natural reach and at least one size category smaller than you. This grants the partner partial cover, and the feat comes with Bodyguard and In Harm’s Way synergy. Improved Partner Screen lets you reduce damage the partner takes by your level, stacking with DR; damage thus prevented is applied to you instead, but is subject to DR, resistances and immunities. (Minor nitpick: The Prerequisite here notes “Improved Partner Screen”, when the feat can’t have itself as a prerequisite – that should just be Partner Screen. Spell-sharing Bond requires the ability to cast 2nd level spells, and whenever you cast a harmless spell or SP with a duration exceeding 1 round targeting a single creature, you can spend 1 Resolve Point to share the spell or SP’s effects with the partner if they’re within your reach. Both targets gain full benefits, but duration is halved for both. Strike in Unison nets your partner the option to make an attack at -4 to the attack roll as a reaction whenever your critically hit an opponent, provided the partner is within 100 ft. of you. This works the other way round as well, and only works with weapons eligible for AoOs. Tandem Movements makes you immune to the harmful effects of your partner’s attacks while within range of the partner bond’s granted telepathy. The feat gets interaction with charm and similar effects right. Kudos! Editing and formatting are very good on a formal and rules language level. I only noticed cosmetic hiccups that won’t bother any but the most picky of folks. Layout adheres to the series’ two-column full-color standard, and the pdf has a really neat piece of artwork. The pdf has no bookmarks, but needs none at this length. 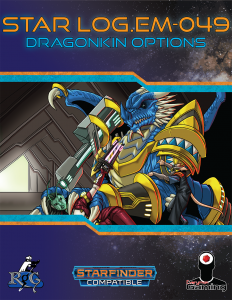 Alexander Augunas’ dragonkin options are diverse, and for the most part very interesting: The focus on the partner bond as a social mechanic and as a teamwork facilitator is something I genuinely enjoyed seeing. As such, I will round up from my final verdict of 4.5 stars. You can get these cool options here on OBS!